The second volume of the Healthy Community Design Toolkit is now ready for download and use. This volume focuses on strategies that cities and towns can use to increase food access for their residents. 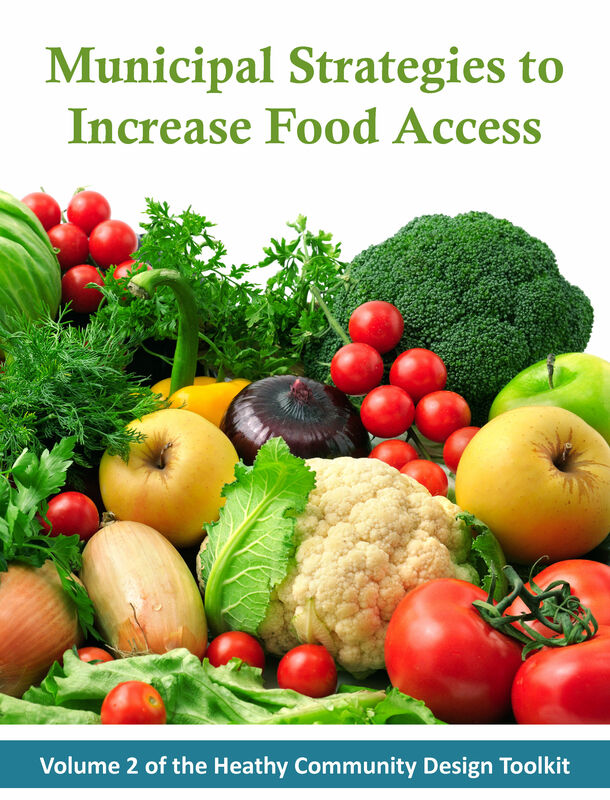 It presents, to date, the most comprehensive range of food access strategies suitable to Massachusetts cities and towns. Municipal Strategies to Increase Food Access is intended for use by municipal staff and board members, Mass in Motion Coordinators, and community food advocates, and others. Strategies that affect change in municipal systems are presented first, followed by strategies related to food production and food retail. Each section describes the strategy and the change sought through its implementation; presents the motivations for and challenges in pursuing them; and offers guidance for how municipalities might implement strategies. Case studies describe how strategies have been implemented; Massachusetts examples are highlighted where they exist to give the reader a sense of what is accomplishable in the context of Massachusetts state and local governments. Additional resources are linked or included in the appendix, and these include guidance documents and in some cases, model language for ordinances and bylaws. The report is the result of a collaboration between PVPC, Metropolitan Area Planning Council, Massachusetts Association of Health Boards, Massachusetts Municipal Association, and Massachusetts Department of Public Health. This report highlights strategies that cities and towns can use to increase access to health food for their residents. It is the second volume of the Healthy Community Design Toolkit.